The number of WHL teams looking for a head coach is expected to fall to three today (Monday). The Spokane Chiefs are expected to name Dan Lambert as their new head coach today, a source familiar with the situation told Taking Note on Sunday evening. responded to a request for confirmation. Lambert, 47, was fired last week by the NHL’s Buffalo Sabres. He had spent one season as the head coach of their AHL affiliate, the Rochester Americans. From St. Malo, Man., Lambert is a former WHL defenceman and coach. He played four seasons (1986-90) with the Swift Current Broncos and, in fact, captained their Memorial Cup-championship team in 1989. After a professional career that included 29 NHL games with the Quebec Nordiques — he had six goals and nine assists — Lambert signed on as an assistant coach with the WHL’s Kelowna Rockets. After five seasons, he was named head coach for 2014-15 and guided the Rockets to a 53-13-6 record and the WHL championship. They reached the Memorial Cup final, only to lose 2-1 in OT to the Oshawa Generals in Quebec City. Chances are good that Carter had more than one conversation about Lambert with Bruce Hamilton, the Rockets’ president and general manager. Carter and Hamilton are friends and both are involved with the B.C. Hockey Hall of Fame in Penticton. In fact, when the decision was made to induct Carter, who is a co-founder of the hall, it was Hamilton who phoned with the news. 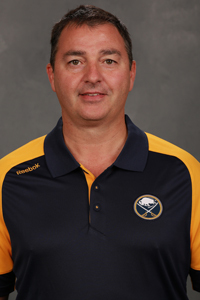 Lambert left Kelowna prior to 2015-16 to sign with the Sabres as an assistant coach under head coach Dan Bylsma. After that season, Lambert was assigned to Rochester as the head coach. In Spokane, Lambert will replace Don Nachbaur, who had been there for seven seasons. Nachbaur, the third-winningest head coach in WHL regular-season history, and the Chiefs parted company when their season ended despite his having one season left on his contract. This season, the Chiefs finished 27-33-12 and missed the playoffs. With Lambert in Spokane, it will leave the Calgary Hitmen, Kootenay Ice and Victoria Royals without head coaches. 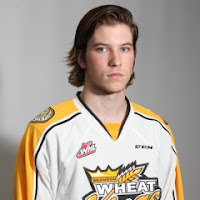 F Nolan Patrick of the Brandon Wheat Kings is expected to be one of the first two selections when the NHL’s two-day 2017 draft opens in Chicago on June 23.
points, 13 of them goals, in 21 playoff games as the Wheat Kings won the WHL championship. This season, however, wasn’t even close to that for Patrick, who will turn 19 on Sept. 19. He missed the start of the season after undergoing sports hernia surgery in July, then was plagued by another hernia during the season and played in only 33 games. Still, he had 20 goals and 26 assists. Patrick spent the latter part of last week in Buffalo at the NHL Scouting Combine, where he spoke about his injury-plagued 2016-17 season for the first time. “It is what it is, I don’t get mad about it or frustrated when people ask me,” Patrick told reporters. “I had two hernias at the same time, they missed one, but I’m not disappointed in the doctor. He was trying to do the best job he could. It happens sometimes. You know that some NHL teams will have been quizzing Patrick about his health, and now it seems the New Jersey Devils and Philadelphia Flyers, who hold the first and second selections respectively, want Patrick to spend some time with them so that their own medical people can give him a going over. Because he’s 19 and will have been drafted off a major junior roster, Patrick will have to be returned to the Wheat Kings if he doesn’t make an NHL roster for 2017-18. The Red Deer Rebels, who held a prospects camp on the weekend, have signed F Ethan Rowland and F Jordan Borysiuk. . . . Rowland, from Calgary, was the Rebels’ first-round pick, 22nd overall, in the WHL’s 2017 bantam draft. He will turn 15 on Sept. 24. This season, Rowland had 14 goals and 25 assists in 34 games with the bantam AAA Calgary Northstar Sabres. . . . Borysiuk, 15, is from Mannville, Alta., and was a third-round pick in the 2015 bantam draft. . . . He had 16 goals and 24 assists in 30 games with the Pursuit of Excellence bantam prep team out of Kelowna this season. . . . Both players announced their signings via Twitter. The Quebec Remparts used an eighth-round draft pick to take D Braeden Virtue of Worcester, Mass., during the QMJHL draft on Saturday. . . . The 6-foot-0, 180-pounder is the son of former WHL player and coach Terry Virtue. A defenceman, he played for the Victoria Cougars, Tri-City Americans and Portland Winterhawks (1988-91) and was an assistant coach with Tri-City for three seasons (2007-10). . . . This season, Braeden, 16, played for the U-16 Islanders of the U.S. Premier Hockey League. He had four goals and nine assists in 26 regular-season games. Prior to Saturday’s Stanley Cup game between the Pittsburgh Penguins and the host Nashville Predators, James Duthie of TSN was on Twitter, proving once again that it's a great time to be alive . . . The guy who threw the catfish on the ice in Pittsburgh is currently holding an autograph session in Nashville.